Youth Farm celebrates double digits! 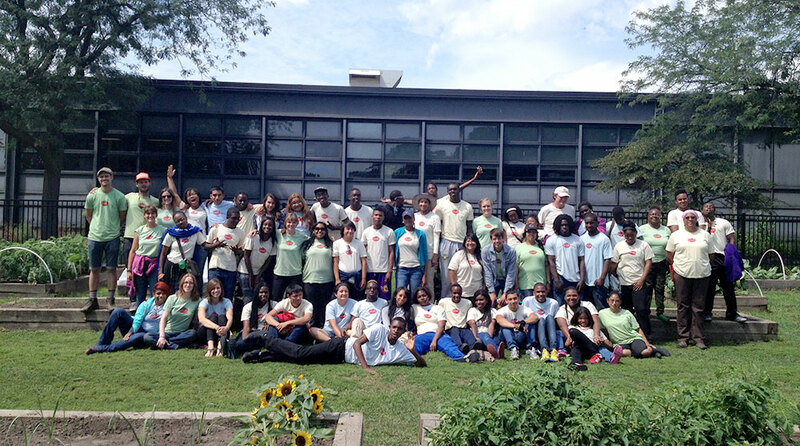 The Chicago Botanic Garden’s urban youth outreach and development program, Green Youth Farm, is celebrating its ten-year anniversary this year! What started as one lone staffer and 13 teens on 1.5 acres in the Lake County Forest Preserve has grown to a program with up to six sites all across Chicago and in Lake County, cultivating a new appreciation for plants and wholesome food in 90 young people a year, while teaching them job skills for future success! Here’s a year-end recap on the people and hard work that make up Green Youth Farm (GYF). That “lone staffer” mentioned above is also known as our fearless leader and Green Youth Farm program founder, Angela Mason. Angie is also celebrating her ten-year anniversary at the Chicago Botanic Garden. Maybe you haven’t met her…that’s probably because Angie has kept herself pretty busy over the past ten years! Some of the things she’s developed have been the Windy City Harvest (WCH) adult certificate program in sustainable urban agriculture; the Harvest Corps program for young male offenders to learn about gardening while incarcerated and then placed in transitional jobs with our programs post release; the Kraft Foods Garden in Northfield; and most recently, a new partnership with McCormick Place to turn its green roof into a food production site. If you see Angie around the Garden, grab her quick, because she walks really fast, even in heels! 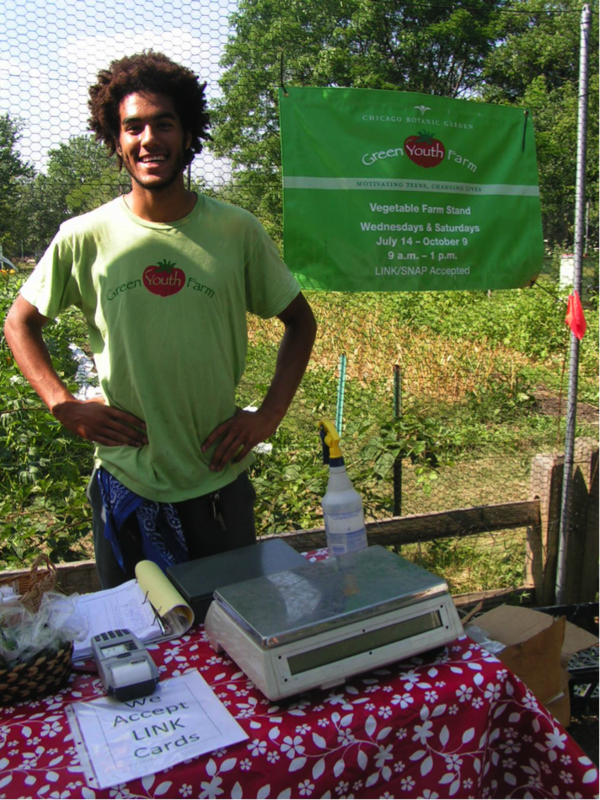 Green Youth Farm hires program graduates! To date, we have two WCH graduates on staff, and have hired 15 Green Youth Farm graduates and WCH students as summer interns. Green Youth Farm grows food! This season alone, on less than two acres of land, students and staff grew more than 25,000 pounds of sustainable fruits and vegetables. Delivery for the WIC cooking demos! Green Youth Farm feeds communities! 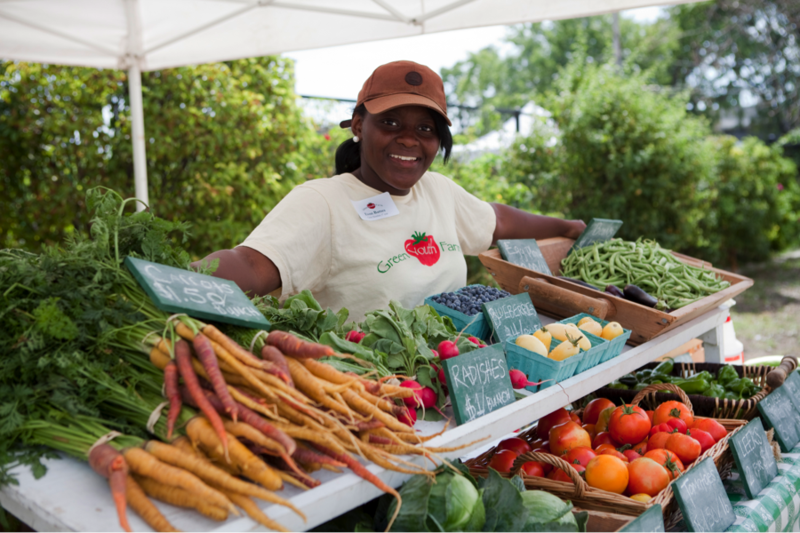 Eighty percent of the food we grow is distributed back into the food desert communities where our farms are located. 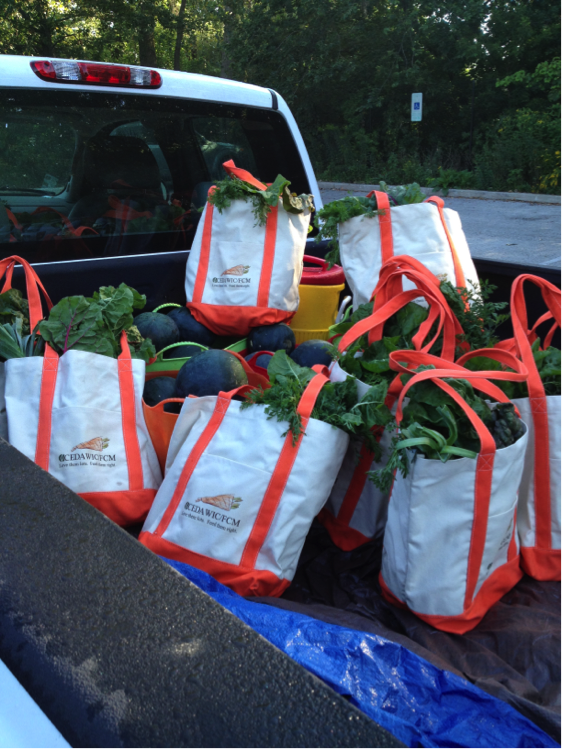 We sell at below-market value prices at our community farm stands and accept all types of federal benefits — the Illinois Link Card; Women, Infants, and Children (WIC); and Senior Farmers’ Market Nutrition Program coupons — as payment. We also partner with WIC through the Community and Economic Development Association (CEDA) of Cook County, the Lake County Health Department, and Sinai Health System to distribute boxes of food to moms with young children in need. Green Youth Farm cooks! Teens learn that “all life depends on plants” by turning the plants they grow into delicious meals! Each week, a crew cooks a wholesome, plant-based meal for their peers, staff, and farm guests. 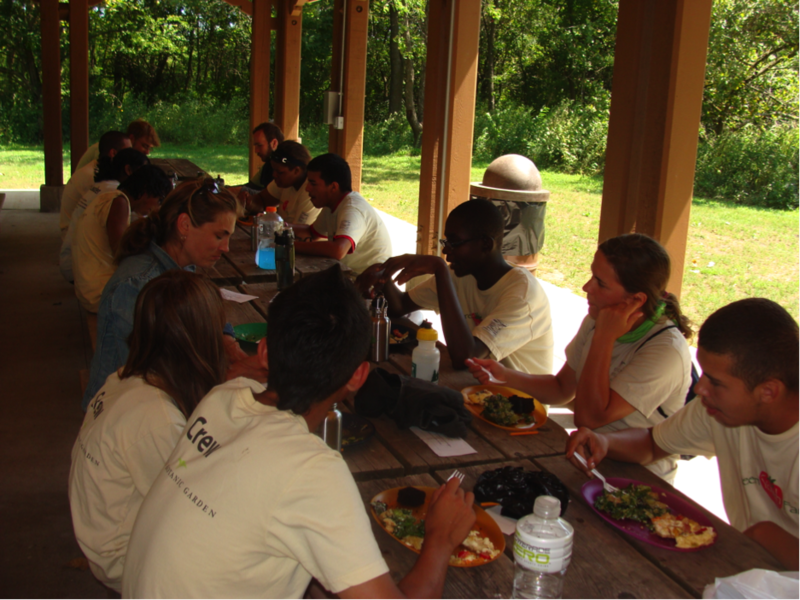 Green Youth Farm staff and students enjoy a farm-fresh meal cooked by crew members! 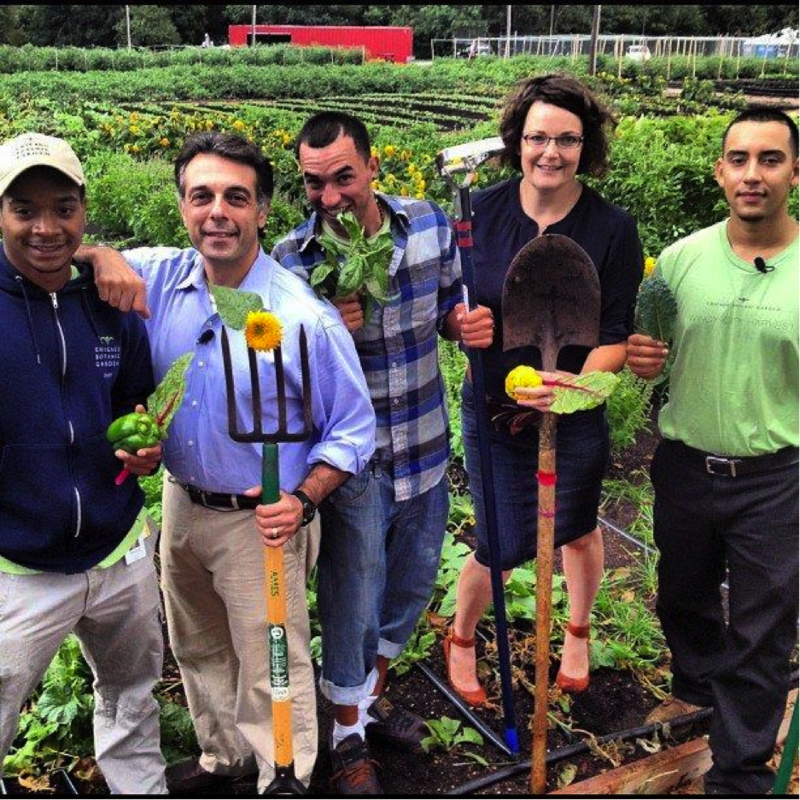 Green Youth Farm students are successful adults! Our alumni leave GYF with a sense of community responsibility, a greater appreciation for the environment, and an understanding of what it means to be successful in whatever career they choose for themselves. They carry these values with them through life, no matter what they choose to do…whether that’s college, a job, farming, or raising a family. We are proud of our GYF alums! Facebook post from one of our alumni currently studying environmental studies abroad during a semester at Colgate University. Julio is the first in his family to attend college. 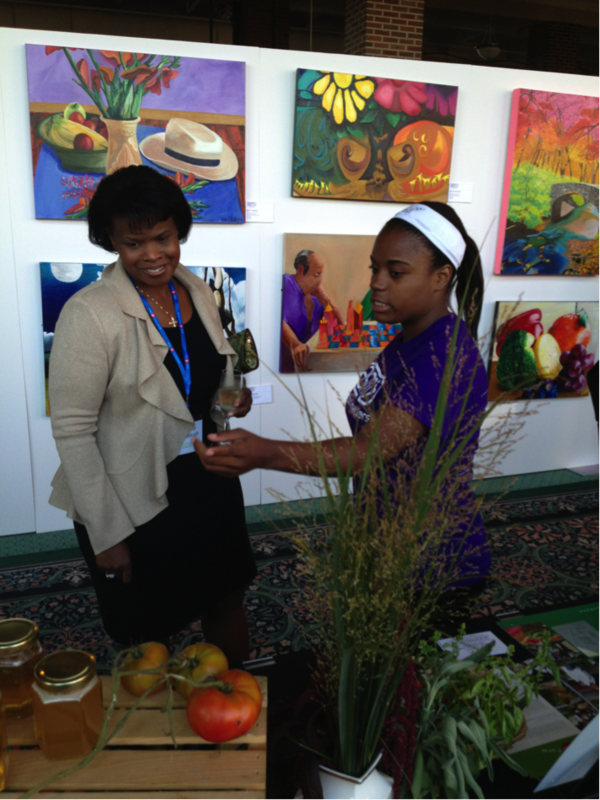 GYF inspires horticultural and food entrepreneurs! Former interns, growers, and coordinators have started businesses all over the United States. These include urban farms at tenspeedgreens.com, food trucks using local, sustainably grown food at luluslocaleatery.com, and sustainable floral design with fieldandflorist.com! Tatiana shows off her hard work at the After School Matters annual gala event. Green Youth Farm partners! Staff from Green Youth Farm works with more than 34 partners from all different kinds of organizations to help deliver quality programming in the communities we serve. Some of these include the Lake County Forest Preserve District, the Chicago Park District, NeighborSpace, Chicago Public Schools, After School Matters, and Neighborhood Housing Services of Chicago, Inc.
Green Youth Farm loves volunteers! This year, GYF saw the most dedicated crew of volunteers in its history…volunteers came together to support programming when teens were on-site and do the dirty work of farming when teens were back in school. If you are interested in learning more about the work we do at GYF to cultivate the power of plants to sustain and enrich life in our city’s youth, contact the Chicago Botanic Garden volunteer department! Posted on December 9, 2013 June 4, 2014 Author Eliza FournierCategories Community GardeningTags Community Gardening, green youth farm, GYF, urban agriculture, WCH, Windy City Harvest1 Comment on Youth Farm celebrates double digits!